I have lived in Birmingham, Alabama, Atlanta, Georgia, NYC, LA, Florida, and at the moment, I am seeped in the Southern life of the Mississippi River, a huge Rameses II statue, music, and barbeque here in Memphis, Tennessee. I hope to never move again, unless I win the lottery, then I will have an apartment in Manhattan at the Chelsea Hotel. Art has always been a part of my life. And I believe that art isn't only something I do, it's also something I practice. I believe in the art of life and spirit. I am always looking for ways to improve. Other artists are my prime influence. I can learn so much simply by looking at the amazing work of other artists. There are no words, just color, form, lines, shapes. Something inside of me gets gleefully happy when I see a work of art that clicks. I love the darker, romantic art. 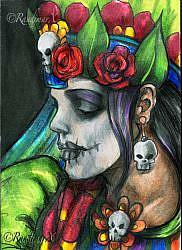 I am a huge fan of Day of the Dead, Halloween, dolls of all kinds, mystery and magic, Autumn and Winter, the spiritual connections of Lughnsadh, Mabon, Samhain, Yule, and Beltane. I am interested in work that is scary-cute (Like the Living Dead Dolls), done with mixed media, unique surfaces and assemblage. I love tiles and paper clay sculpture. I haven't tried paper clay yet, but I am hoping to learn that technique. There is just so much I want to learn, so much I want to understand, and I hope that I can meet more and more artists who help enlighten me each day with their/your amazing talents!